Have you got unwanted branches in your garden that you wish to cut? If yes, you need the equipment that will do the job in the most efficient manner. This is where a ratcheting lopper comes in handy to help out. Without having the risk of breaking or expending a lot of energy, you can cut down those branches with ease. However, you need to choose the right lopper to do the job. In case you lack information on best ratcheting loppers in the market, take a look at below reviews. By checking each lopper, you would be in a position to make a better choice to keep your garden in good looking condition. Top 05 Best Ratcheting Loppers Reviews. The spear and Jackson heavy duty ratchet anvil lopper comes with a ratchet action to facilitate easy cutting in simple, short steps. Armed with the SKF carbon steel blade for lasting sharpness, the lopper offers comfortable grips for cutting. Also, the blades are coated with rust-resistant PTFE coating. The 8290RS razorsharp lopper is an ideal item for cutting harder and thicker limbs of branches in your backyard. With light, yet strong aluminum handles, you can easily carry out the cutting chores without slipping the item from your hand. You also get a locking catch for safe storage of the product. The biggest plus of 8290RS is its sturdy and well designed built. No matter how often you carry the trimming and cutting chores, the product is meant to last for a long time. With little care and maintenance, you can ensure its companionship for many years. Above all, the product is pretty easy to use and comes with enhanced safety features. Additionally, the item is backed by 10 year guarantee. The 8290RS lopper needs a lot of space when you use it with handles fully extended. Some users find it annoying. However, you can get used to it with little practice. Other than that, there are hardly any downsides of this highly rated lopper. The ML garden tools L8230 lopper includes the SK-5 high carbon steel blade with the unmatched ratcheting mechanism. With a higher extendable length, you can cut remote branches that are hard to reach out. The lightweight, sturdy handles with non-slip grips make your job easy and hassle-free. You can set the extendable length at any position between 27 to 39.5 inches, which allows you a usable length of 25.5 to 38.5 inches. With the cutting capacity of 1.75-inch diameter, the ratcheting mechanism ensures you finish your gardening chores in pretty less time. Due to light weight handles, cutting and pruning become not only easy, but also enjoyable. The ML L8230 is a light weight ratchet ideal for all types of users for cutting unwanted tree branches in their garden. With highly extendable blades, you can carry out the trimming chores within no time. The most important perk of buying ML L8230 is it is really affordable. In exchange for a minimal amount, you can own a top rated lopper to maintain your garden in pristine condition. Certain users have issues with the plastic handle. While the plastic handle guides the inner handle shaft, it keeps falling out when extended, and you have to keep in place using some heavy duty tape. Despite this minor drawback, users are really pleased to own this lopper. Just try out the Fiskars 32 inch powergear2 lopper, and you will be surprised with its handiness. Fiskars updated design features modified gears and an innovative cam mechanism for optimizing the cutting power. Its premium blade (finished with a rust-resistant), improved cutting geometry and low friction coating make cutting and pruning in tight spaces easy and effortless. The lopper can power through branches up to about 2 inches in thickness. With the patented PowerGear technology, the lopper gives you about 3 times more power on each cut. The product is designed in such a manner that it lets you cut the toughest part of the branch with minimum pressure. To ensure smooth cutting and pruning, the lopper features a fully hardened bypass steel blade. It also ensures less gumming, and offers resistance to rust. The rounded ergonomic handles with soft grips touch-points enhance control and comfort while using the lopper. You have to open the handles wide to ensure smooth and effective cutting of branches. Users find it difficult and uncomfortable while extending its blades. Also, some folks have complained about weak blade handles. Despite these drawbacks, the lopper makes an ideal fit in smaller gardens. Product-04: Tabor Tools GG12 Compound Action Anvil Lopper. The Tabor tools GG12 compound action anvil lopper is an ideal choice for cutting green and hard/dry wood. 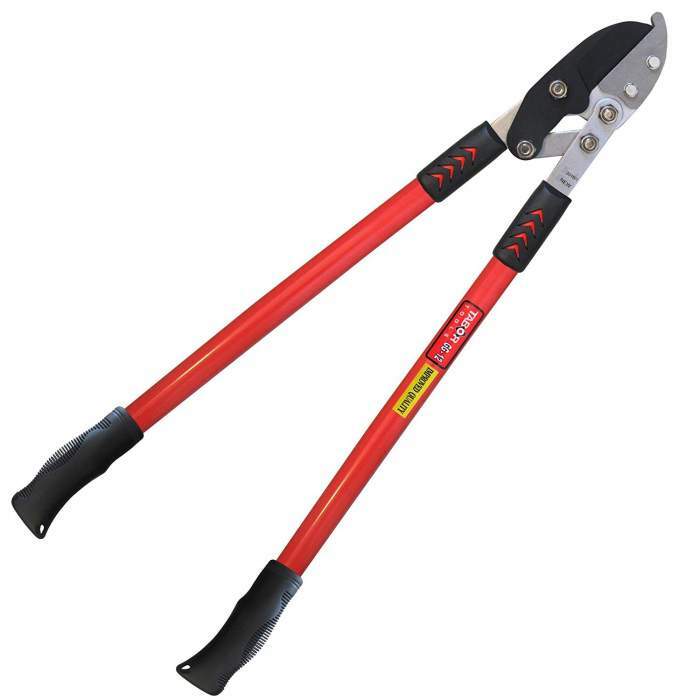 Due to their innovative design, these loppers are able to chop thicker branches. As such, these anvil loppers make an excellent tool to trim back live wood before making a clean, final cut with bypass loppers. The compound lever system along with moving parts and multiple pivot points increases the power and force applied to the blade, and the result is quick cutting. Also, the lopper features a soft grip handle cover for optimum performance and enhanced comfort. With precision ground anvil blade and super cutting geometry, you can carry out exceptionally smooth and clean cutting of branches with optimal force transmission. Built like a tank, the tool cuts with ease. It can cut hard, thick branches beyond your expectations. The lightweight body of the lopper makes cutting and trimming effortless. No matter whether you are up for cutting a few branches or a pile of tree limbs, the lopper lets you complete the job quickly to your fullest satisfaction. Although there are no known drawbacks of the product, some users, especially those with a tight budget, feel that its price is a bit higher. Apart from that, users are really happy to own this item. With maximum positive reviews, it is no surprise why this lopper is the hot choice of majority of buyers. Product-05: Fiskars Ratchet Drive Anvil Lopper. The Fiskars ratchet drive anvil lopper is a medium sized tool for cutting and trimming branches of trees. Its ratchet design compounds force with some easy squeezes for maximum cutting without putting strain on your arms. The fully hardened blade stays sharp even during heavy usage, and its maximum cutting capacity is 2-inch diameter. With an easy to use ratchet design, the lopper is capable of cutting thick branches with minimum effort. All you have to do is insert the designated branch between the blade and anvil and squeeze; that’s all. Within no time, you will finish the trimming job with this handy tool. Aside from being lightweight, the lopper is smaller in size. This makes it ideal for cutting smaller branches with ease. Also, the tough design of this lopper consists of a steel exoskeleton and rugged DuraFrame handles for extra longevity. Above all, the tool comes with a really smaller price tag, allowing you to recoup its cost at the earliest. Some users have reported that the blade snaps off after constant use. Also, some buyers face problem when cutting bigger branches. However, with proper attention, you can overcome this minor downside. 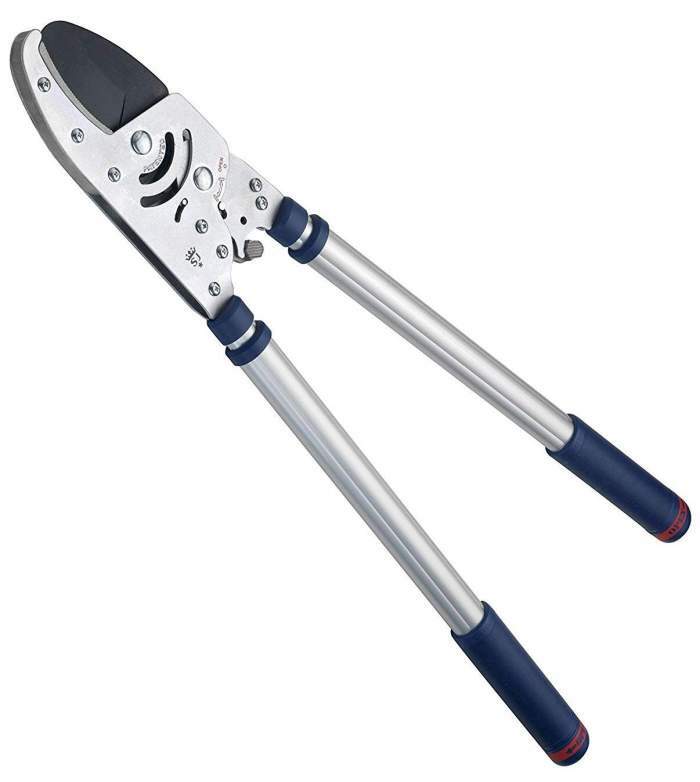 Ratcheting loppers can be classified in various types. On the basis of blades, there are two types of loppers – bypass loppers and anvil loppers. The type of lopper you buy largely depends on the type of your pruning needs. Bypass loppers have two blades that glide past each other while cutting. They are ideal for cutting big limbs. Anvil loppers, on the other side, have only one blade. They work like a knife and are suitable for cutting dead wood or trimming back live before using a bypass lopper. On the basis of cutting mechanism, ratcheting loppers can be divided into three types – regular ratcheting loppers, compound action loppers and geared loppers. The regular ratcheting loppers are standard loppers where the ratchet clicks and provides additional pressure on what you are cutting through. Compound action loppers come with a special lever and pivot point action which helps to exert extra pressure. This in turn facilitates smooth cutting of hard, thick branches with minimum pressure. Geared loppers come with a gear set below the cutting blades. When you open the lopper and put it around the branch, the cutting power is compounded by the gear, ensuring precision cutting. However, you need to open the handles wide and set it properly before closing and re-engaging the gears. How to choose the best ratcheting loppers ? Loppers come in different shapes, prices and designs. All these things make it a bit difficult to choose the right lopper. However, you can get through this chore by following these handy tips. You need to know what kind of pruning needs you have. For instance, if you have smaller limbs to cut, a smaller lopper might be an ideal choice. On the flip side, a longer lopper such as the bypass lopper with sharp blades could be a better bet for cutting down larger branches. A light weight lopper renders maximum cutting comfort, but it is likely to break quickly. On the other hand, a bulky lopper can cut down hard branches of trees effortlessly. However, it can be highly discomforting to cut tree branches with such loppers. As a thumb rule, choose a lopper that is light as well as durable enough for cutting and pruning. Pricing is another parameter that affects your buying decision. However, don’t go for a very low-priced item. Such a piece can break quickly, and is hardly backed by a warranty. Try to make a balance between price and quality to get the best lopper with the most optimum price. How to use best ratcheting loppers ? You may want to put on safety glasses and work gloves when working with a lopper. Choose the exact spot for cutting and a healthy cutting angle. When using loppers, you may want to consider the following steps. For an exactly placed cut, line up the blade with the cutting side. Now open your loppers completely and insert the branch deep into the blade. While it is tempting to snip-snip wood like scissors might cut a paper, this method will stress your hands and the blade will wear out quickly. Instead, try to cut the wood in a fluid motion. Make sure to properly position the wood and close the loppers. While it will take some time to ensure effective cuts, you can attain proficiency over time and get smooth cuts. Choosing the right ratcheting lopper may seem to be a daunting task due to the availability of so many brands out there. However, you can ease this herculean chore by taking a look at the best ratcheting loppers as endorsed by customers. Just be sure you review only the best loppers and surf through the handy tips on choosing an ideal lopper as discussed above. With the right information by your side, you are on your way to buying the right lopper for keeping your garden in its best possible condition. FAQS to answer before buying best ratcheting loppers. FAQ-1: Is the product backed by a warranty? Answer: You can’t be an expert in fixing loppers. The product you are buying should be backed by a service warranty. FAQ-2: Does the buying kit come with a user manual? Answer: Although any lopper is not difficult to use, you may need help on how to go about cutting hard branches. The buying kit should include a handy user manual for uses and upkeep of the item. FAQ-3: Does the product adhere to safety measures? Answer: Loppers can injure yourself when pruning trees. Any manufacturer has to adhere to standard safety measures to ensure user-safety. Stay away from products that do not abide by safety guidelines. FAQ-4: Can you get replacement parts easily? Answer: There is no point in choosing a lopper if its parts are not readily available. So be wary of this point and make certain that the parts of the lopper are easily available for replacements. FAQ-5: Are customers satisfied with the product? Answer: A good product should have a series of positive reviews. If you find more negatives reviews about a particular lopper, look for other best ratcheting loppers that have multiple positive reviews.